entrepreneurs, and opportunities. Sadly, the poor made up about 75% of the city’s population. Jane Addams was always moved when she saw people who were poor. On a trip to London she visited what was called a "settlement house" built to help the poor. As soon as she returned to Chicago she and her friends used their own money to buy an old mansion the middle of an immigrant neighborhood, and turned it into a settlement house called the Hull House. Jane Addams worked hard to provide many services to enable the poor attain a better life. At the Hull House, Jane and her friends offered education programs, job training, child care, safe playgrounds, and art classes to thousands of people. The Hull House rang with music and dancing as Ms. Addams encouraged each immigrant group to celebrate their special heritage from their homeland. In addition to their teaching, the women at Hull House had to give extra help to the women and their children find better ways to live and survive in the city. They would often work to convince the city to improve its services to keep the neighborhood safer and cleaner, as well. The Hull House grew until it had 13 buildings and a summer camp in Wisconsin. In her spare time, Jane Addams worked tirelessly for workers’ rights, and the rights of women and children. Because she believed that having the vote of women would change things for workers and children, she was actively involved in the Woman’s Suffrage Association, as well. The Hull House became a teaching center. Many people came to the Hull House to train to be a social worker somewhere else in another city, spreading the helpfulness into poor neighborhoods everywhere. Jane Addams –The first woman to win the Nobel Peace Prize (1931), Jane Addams is more widely known for her role in the establishment of Hull House in Chicago in 1889 and the Settlement House movement in the United States. She was a leading force in the women’s suffrage (right to vote) movement for 50 years. Born in Massachusetts to a Quaker family, she taught school and became convinced that society needed to be reformed and freed from slavery and alcoholism. She was president of the Canajoharie Daughters of Temperance in the 1840s. She met Elizabeth Cady Stanton in 1851 at an antislavery rally. They organized the Women’s State Temperance Society of New York. Not until 1853 did Anthony support the cause of women’s suffrage and equal rights, but she remained committed to the cause for the remainder of her life, contributing significantly to the effort to attain equal rights for women. 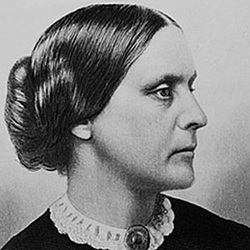 Susan B. Anthony – was a prominent American civil rights leader who played a pivotal role in the 19th century women's rights movement to introduce women's suffrage into the United States.